I love walnuts but they aren’t everyone’s favourite. Have you ever had a fresh just shelled Walnut? They are sweet and very crunchy. If you have ever had those dark, bitter, stale little walnuts in bags from the supermarket then I don’t blame you if you don’t like walnuts. The taste has as much to do with the type of walnut as much as the fact they aren’t fresh. There is hope though. 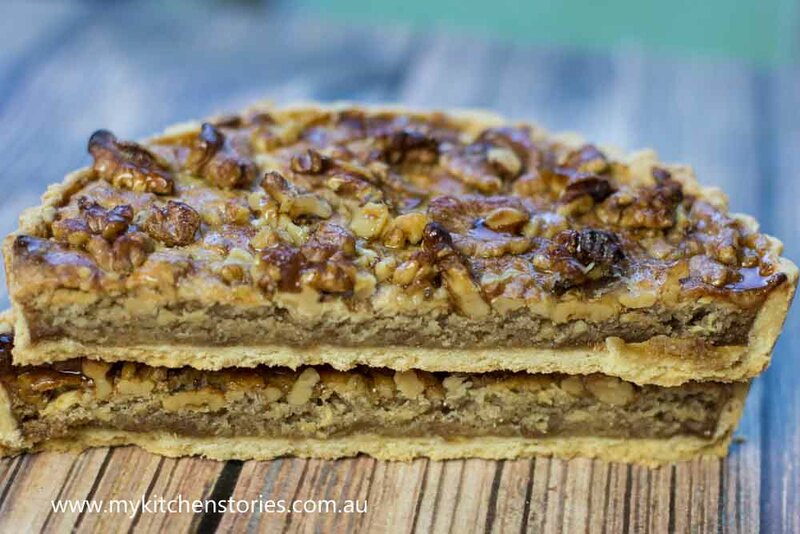 I made this tart from sweet lovely Australian walnuts. Fresh Walnuts are amazing have you tried them? There are almost 1.5 million tonnes of walnuts produced globally each year, the USA and China are the two major producers. 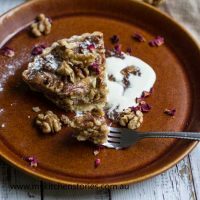 The demand throughout the world for tree nuts is soaring and although Australia produces masses of Almonds and Macadamias they are just starting to enter the race to grow Walnuts. Mind you there is no race when it comes to Walnut growing because it’s four years before you can even think about harvesting a walnut from a tree and then it’s another four years till it actually reaches maturity, eight years in total in investment before any kind of return. Walnut trees are wind pollinated and can grow to 25 metres living a hobbit-ish life of up to 200 years. 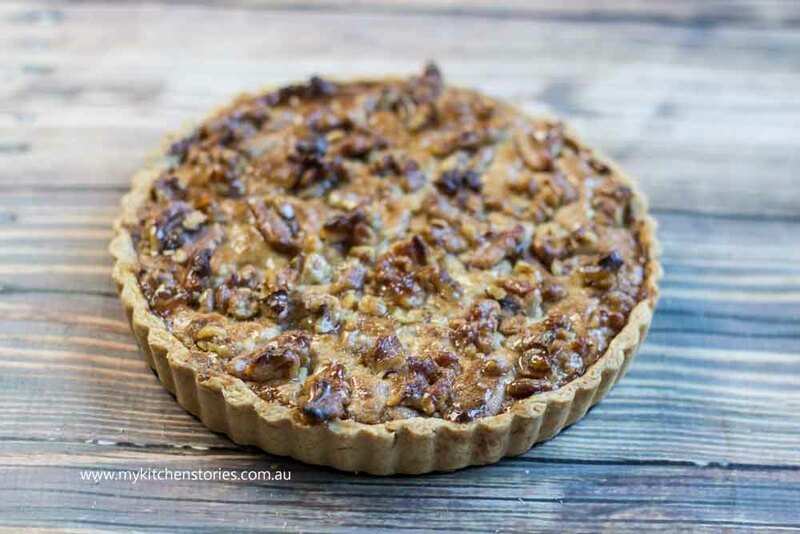 Australia is experiencing an incredible growth in the Walnut industry. Last year we produced 12,000 tons. Does that sound like a lot?. Well California produced 470,000 tonnes and China produced 600,000 tonnes, but hey we are trying. In Australia they are harvested around mid April each year, usually mechanically shaken from the tree. They grow commercially in Tasmania, Victoria, New South Wales with smaller orchards also in the Adelaide Hills and Riverland regions of South Australia and in south-west Western Australia. 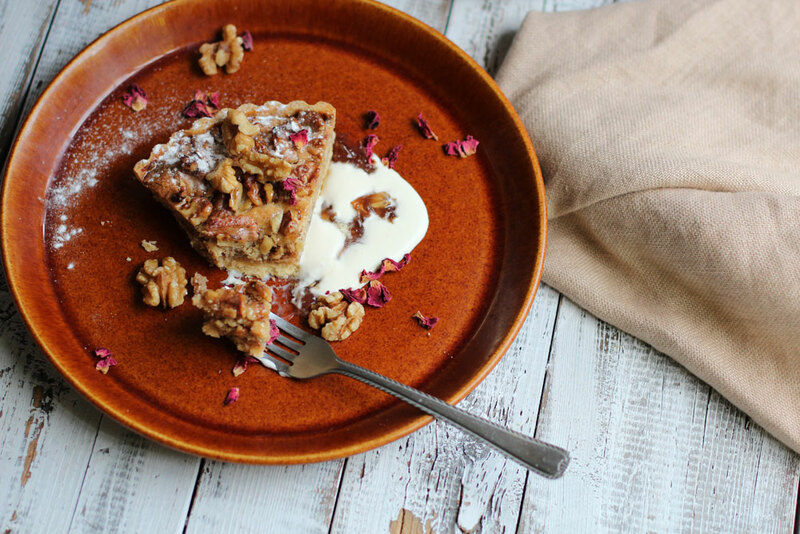 Their is one major producer of note, Walnuts Australia, and they are stepping up the game. They have not only invested in planting but have set up Australia’s first $11 million cracking processing plant at Leeton. Incredibly before now nuts were sent to Vietnam to be shelled then sent back here again!. Most nuts grown here are light coloured and very sweet rather than the dark bitter ones. Try and find some near you and check the difference. Add the (1/4 cup- 60 ml) combined cold water and egg yolk and process till it comes together in a ball. Tip onto the bench and push into a flat disc and refrigerate for 15 minutes. Line with baking paper and bake blind filled with beans or rice for 15-20 minutes then remove the paper and bake till golden ( another 10-15 minutes). 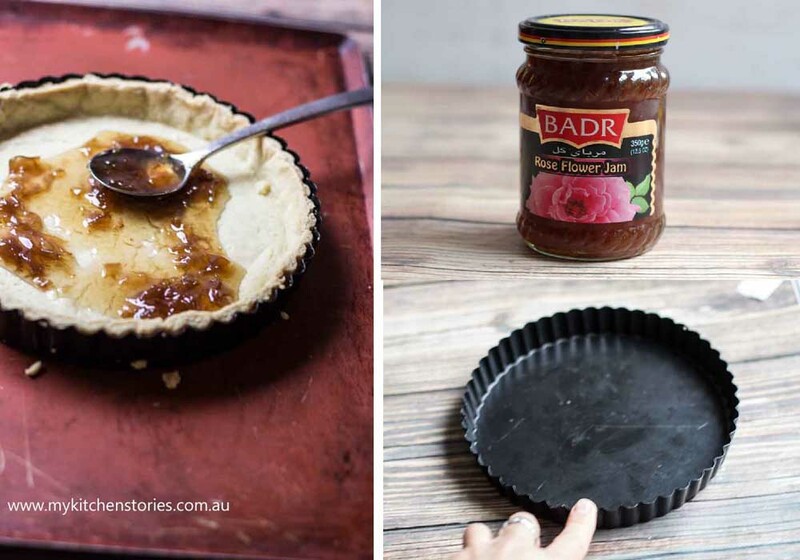 Spread the jam onto the base of the tart case. The filling is like a thick batter . Spoon it onto the base and spread with a spoon and finish by pushing it into place with your fingers Cover with the remaining walnut pieces. I like to paint mine with some melted jam when it comes out of the oven for shine and taste. You will have to dab it a bit as the jam will try to pull the nuts off. if they move just stick them back. Just a note. Add just enough liquid to bring the pastry together. 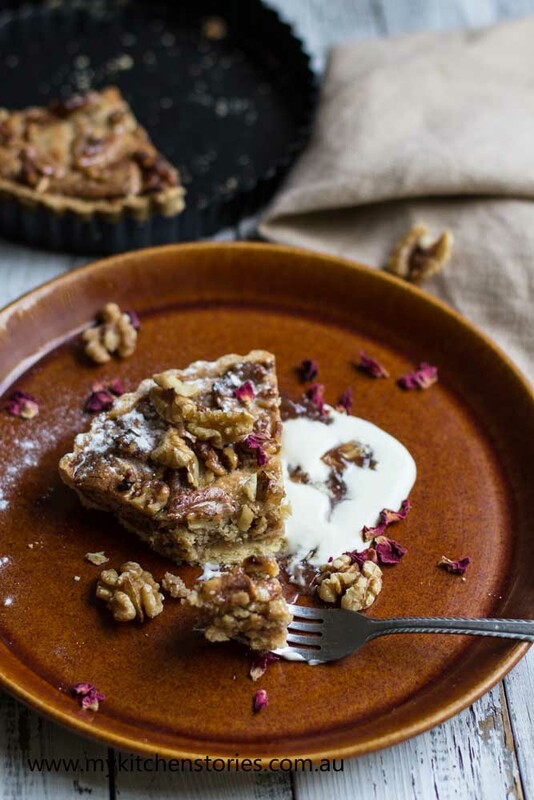 Such a beautiful tart and I love the combination of flavors. When we come to Oregon for the summers we always drive through California, we buy our fresh walnuts there. You really can’t compare packet walnuts to freshly shelled. Huge difference in texture and flavour. Love these tarts! Yep thanks John You are right it makes all the difference. What an incredible looking dessert. And no, I have never had fresh walnuts! I like the regular sort anyway so imagine fresh would be even better. Oh yum! 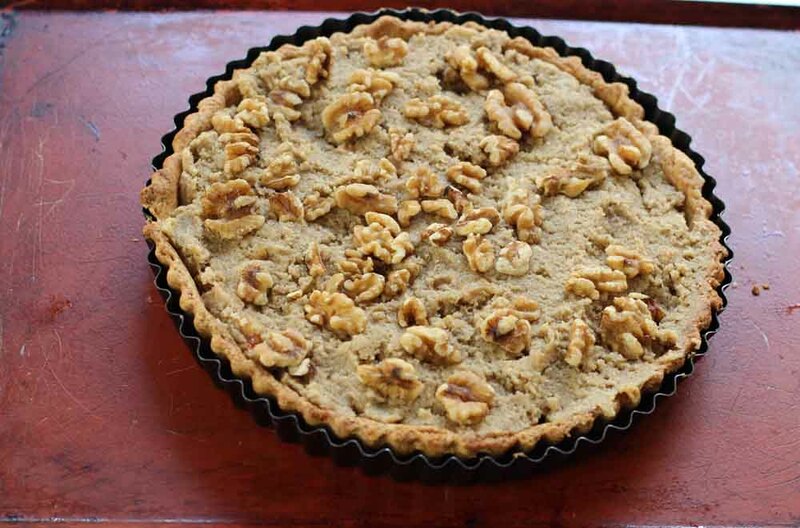 I’m a massive fan of walnuts and I do heart a good tart! Oh I know Sammie, they are delicious aren’t they? Oooh how delicious! I love jam tarts… but this is taking it to a whole new level!